With our NV60 M1 snare drum we have achieved the perfect balance between the classic, vintage sound of the 1960’s and the expectations of modern snare performance and design. Its rich, sophisticated sound suits it to a wide range of musical genres. 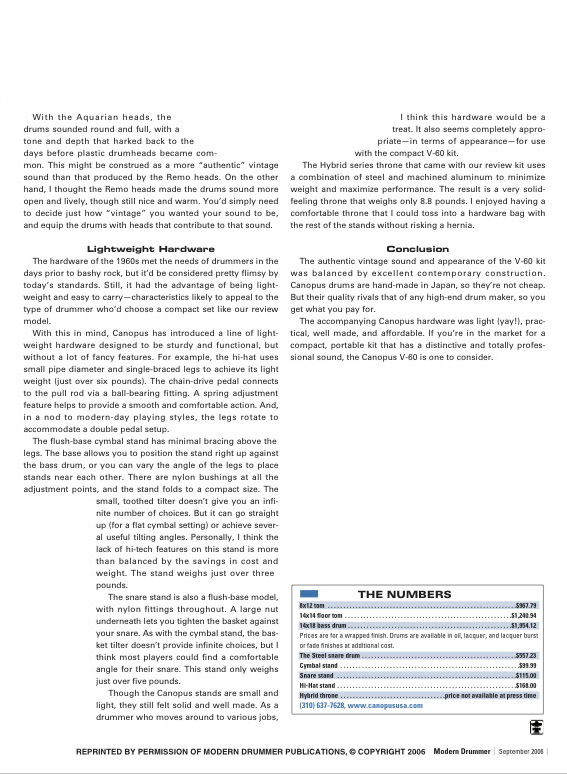 A major attraction of the NV60-M1 is its wider tuning range – which one is unlikely to experience with vintage drums. 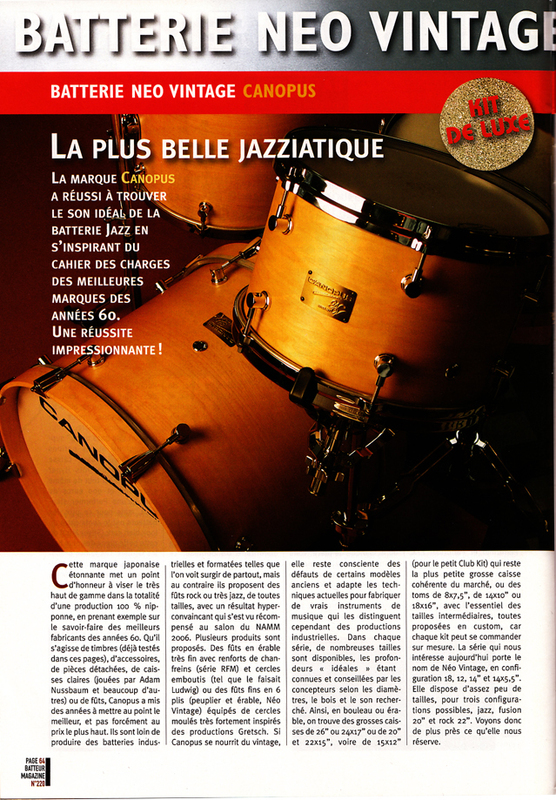 La marque Canopus a reussi a trouver le son ideal de la batterie jazz en s'insprirant du cahier des charges des meilleures marques des annees 60. 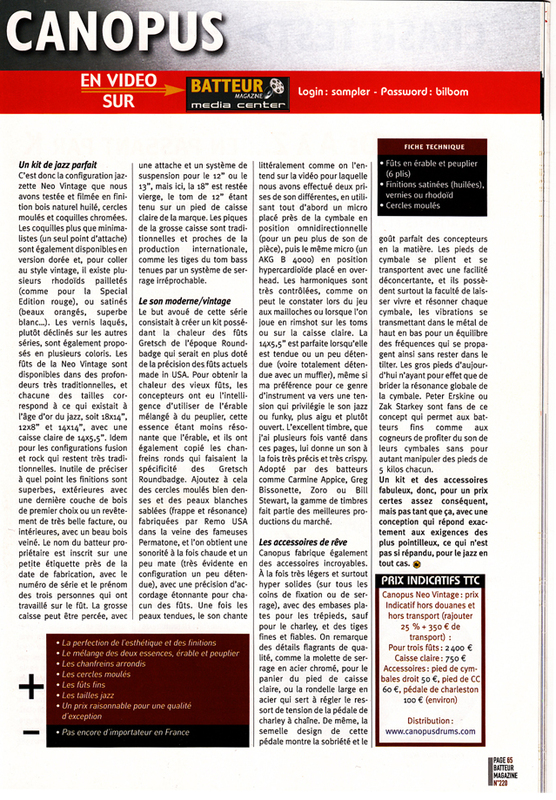 Une reussite impressionnante! The authentic vintage sound and appearance of the V-60 kit was balanced by excellent contemporary construction. 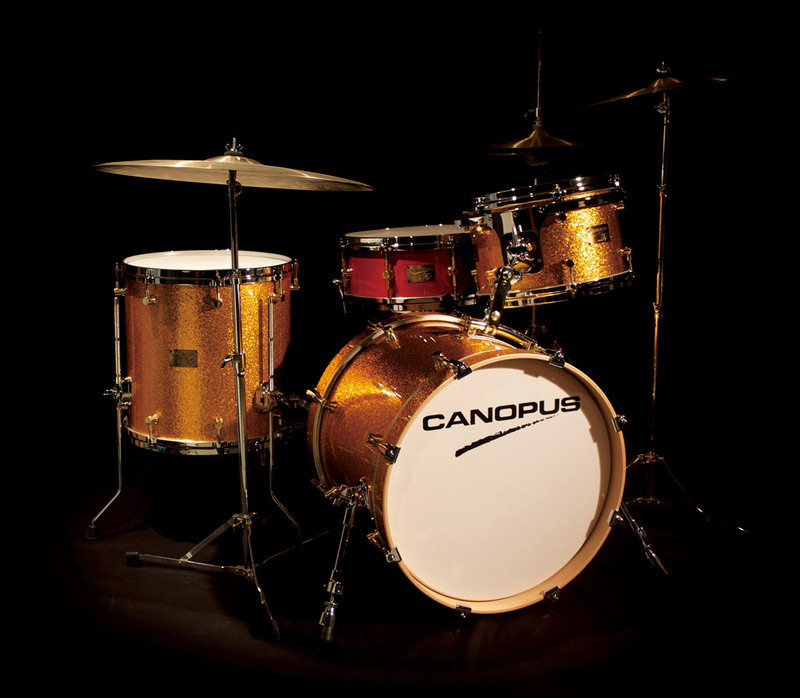 Canopus drums are hand-made in Japan, so they're not cheap. But their quality rivals that of any high-end drum maker, so you get what you pay for. 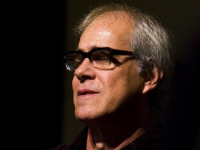 I heard the first time the canopus drum kit in 2011 when I went for the first time in NY. At that time I was looking for a vintage bop kit but finilly I realized that the canopus NV60 M1 sounded exactly the way I was looking for. This drum kit can "sing"!!! These Drums are just amazing. The tuning range is ridiculous. 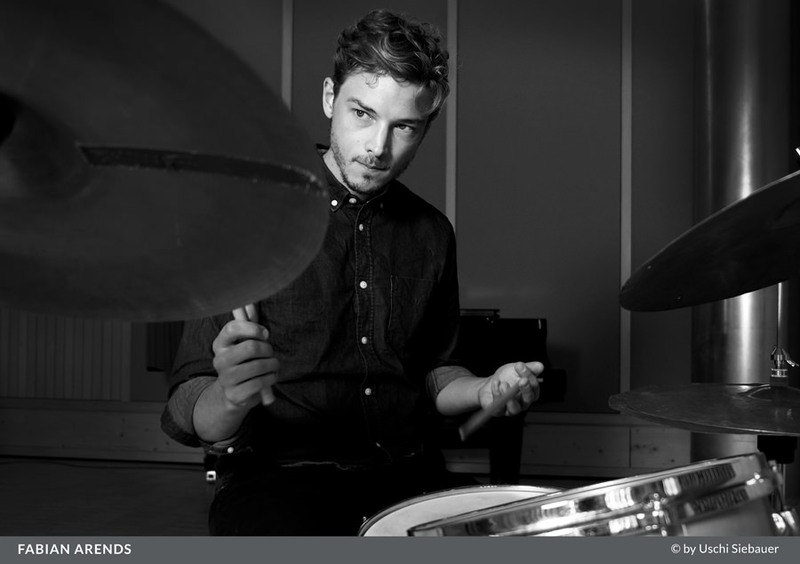 The Bass Drum has so much attack… The Toms sing! The Snare Drum is my favorite from all my Snare Drum collection. 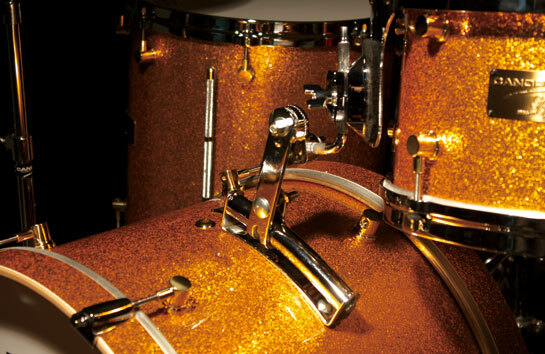 The Neo Vintage NV60-M1 series are the most versatile drums from all the Canopus lines. 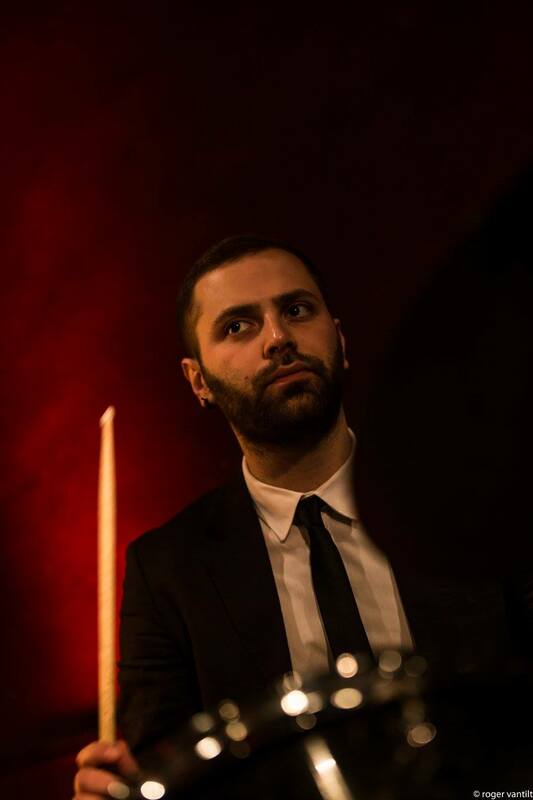 You can play ANY style with these drums, Jazz, Pop, Rock, Latin, Funk, Gospel, literally anything. As a versatile drummer, this set really meets ALL my needs. I Highly recommend any drummer to get them ASAP!. 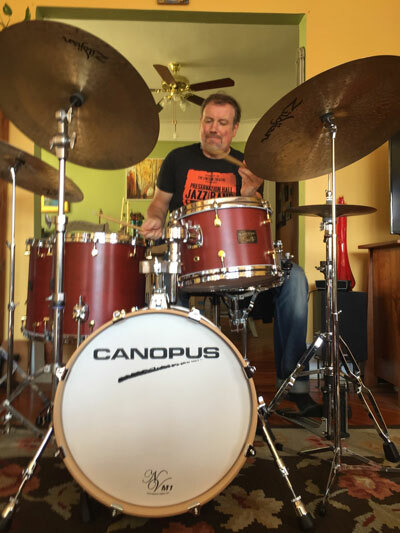 The Canopus NV60-M1 drums are quickly becoming a legendary, much sought-after drum kit, as more great players discover the beauty, depth and versatility of their sound. 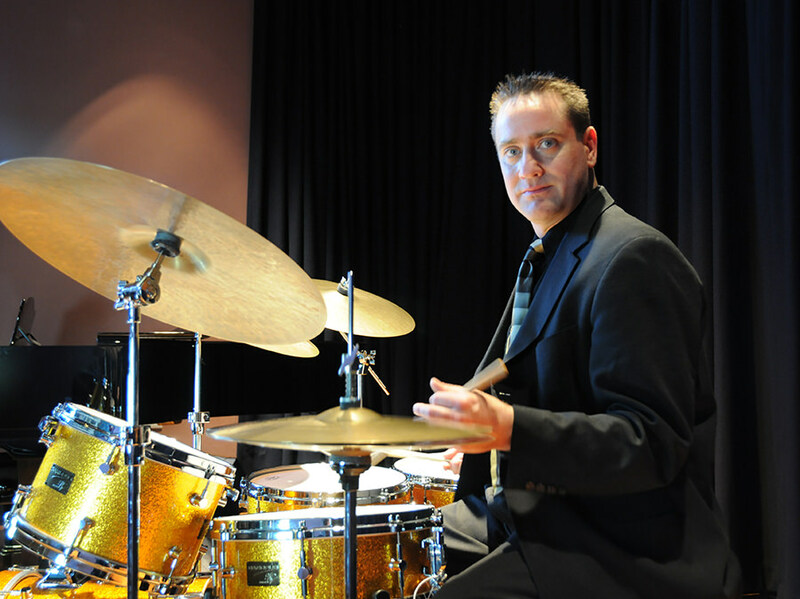 There is a reason that world-class jazz artists such as Clarence Penn, Kenny Washingon, Brian Blade, Harvey Mason, Adam Cruz, Eliot Zigmund, Francisco Mela, Matt Slocum, and many others, choose Canopus; these players can play any gear they wish, and they all sit behind a set of Canopus drums, and trust this instrument to represent them on stage and in studios - that tells you all you need to know! 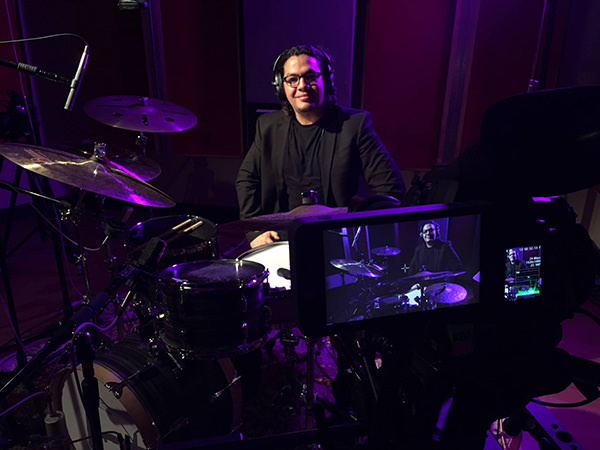 The NV60-M1 drums are also the drums of choice for the finest jazz clubs in New York City, including Smalls Jazz Club, Smoke, The Cornelia Street Café and others. The quality and sound of the NV60-M1 drums is nothing short of phenomenal. They are simply elegant, sophisticated, and just perfect in every way. I tried to find a flaw, whether it be cosmetic or in the sound, and it can’t be done, they are absolutely flawless and truly a dream kit! 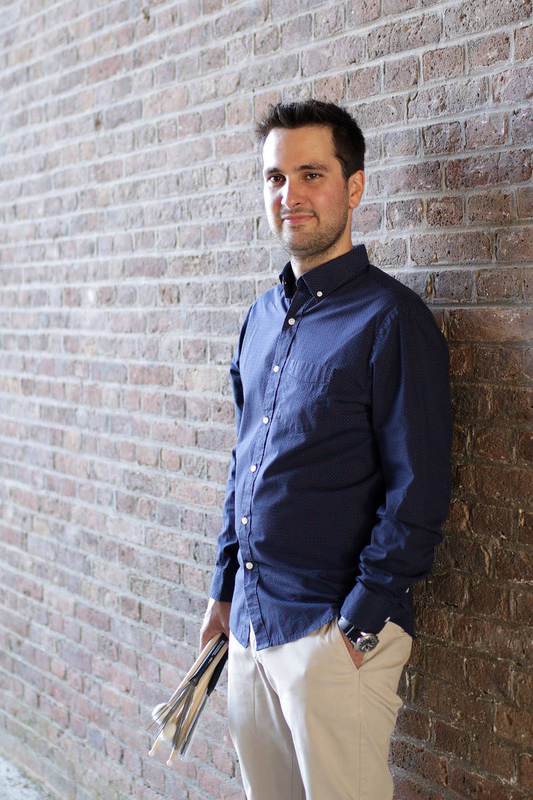 Playing them is an unmitigated joy and they inspire me to play musically, dynamically and melodically – what more could you ask for from your instrument? These drums are very suited for jazz (with the maple/poplar shells and diecast hoops), and they blend perfectly with other acoustic instruments. They will do whatever you need them to do musically, from a whisper to a roar, and can handle a wide range of tunings. You can tune them up to sound like Max, or tune them low to sound like Philly Joe, it’s your choice. 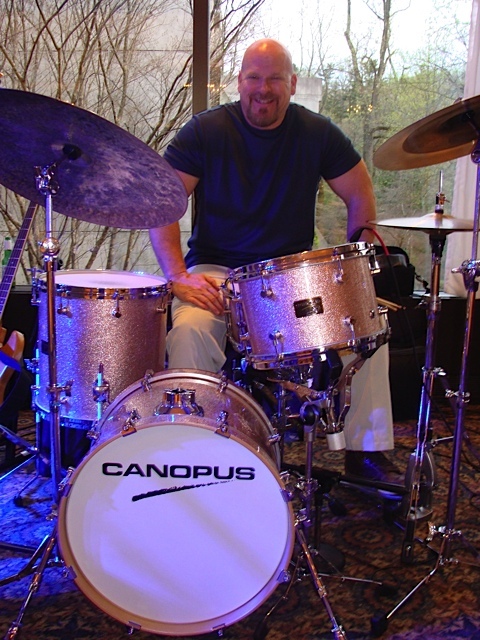 I couldn’t be prouder to represent this great company, and couldn’t be happier with my new Canopus Drums! In all my years of playing, I've played just about every drum brand name imaginable. 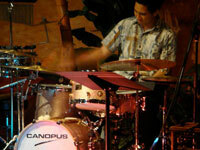 Undoubtedly, Canopus Drums are exactly the sound I've been looking for. Above and beyond their great design, Canopus quality engineering and craftsmanship has developed and produced a clear, clean, and projecting sound that puts Canopus in a league of their own. The name Canopus is truly a rising star. 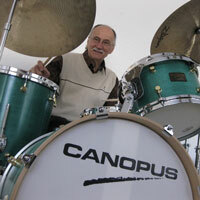 I have the great fortune to now play a set of Canopus NV-M1 drums. This is a wonderful musical instrument. 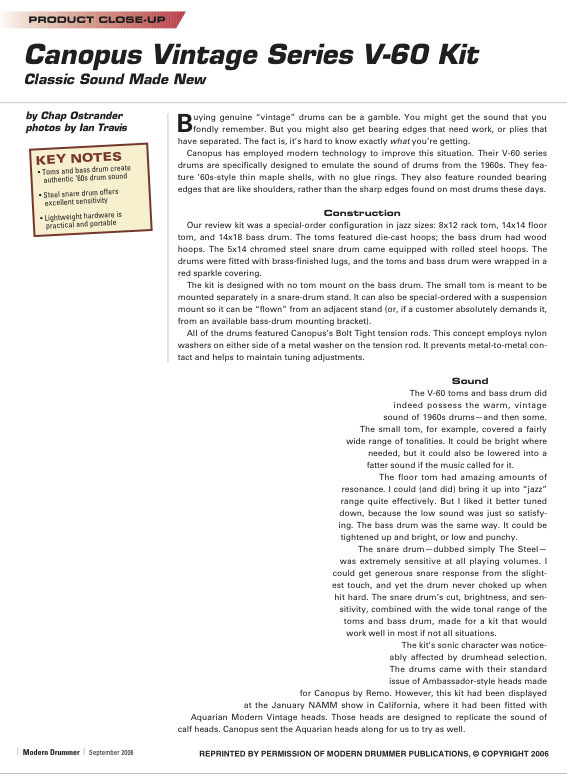 As a lifetime (40+ years) of owning Gretsch, and having studied with Mel Lewis , we know what they used. Had Canopus been on the scene back then I have no doubt that it would have been defined as the quintessential jazz drum kit. While the NV-M1 is promoted as a jazz players drums, I find as someone that plays other styles that the kit is far more versatile . The snare drum is magnificent, warm, but dynamic when needed. The 18" bass drum can tune up high for that jazz sound or tuned down with a touch of muffle to give you some funk when you need it. The toms are open and warm or tight and "Brian Blade like" as you need . What occurred to me during my first gig with them was that I was playing a high quality musical instrument. And while we all know that what you play is what matters most, having a quality instrument to make your statement can go a long way. Oh and yes, visually it's a classy high end looking set of drums. There is a comparison to the old Gretsch, but like comparing a 1958 Maserati to a 2012 Maserati. The nice rounded, clear, but flat, not much ring, die cast sound is there, but the Canopus drums are just so much easier to play and the sound projects so well. Also, they sound and feel consistent in many acoustic settings and have a more versatile tuning range, which was a big problem for all the older drums especially Gretsch. The older 18" Gretsch bass drums (and all the others Ludwig, Sling, etc) were not easy to tune in different acoustic settings. Medium to loose tunings did not produce great bass response or resonance, the 18's sounded best tuned pretty high, young Tony Williams. Some nights they sounded great and then you'd go to another gig and they'd sound terrible, no resonance. The 14x20's were easier to get a consistent sound out of. The 18" NV Canopus is amazing for depth of bass sound, much different than old American companies, hard to believe it's only an 18".